When watching film in advance of last night’s college football championship game, Alabama head coach Nick Saban noticed tendencies he thought his team could exploit if Clemson lined up a certain way on kickoffs. He even told his kicker, Adam Griffith, before the game that he’d likely attempt an onside kick at some point during the title game. 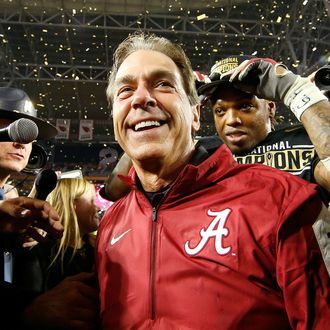 He meant it: After Alabama tied the game at 24 with 10:34 left in the fourth quarter, Saban took a risk and called for one, and it worked marvelously. Griffith’s kick was recovered by Alabama at the 50, and two plays later, Jake Coker completed a pass to O.J. Howard for a 51-yard touchdown. Alabama never gave that lead up and would go on to win its fourth national title in seven years. Saban’s own players agree the decision was a brilliant one: “Desperate times call for desperate measures,” said Alabama center Ryan Kelly. “That’s why he’s the greatest coach, in my opinion.